The new Cape Town Fanwalk is quite an experience. The newly constructed Fanwalk links the Cape Town CBD with the new Cape Town Stadium in Greenpoint via a 2.6km long new pedestrian walkway. 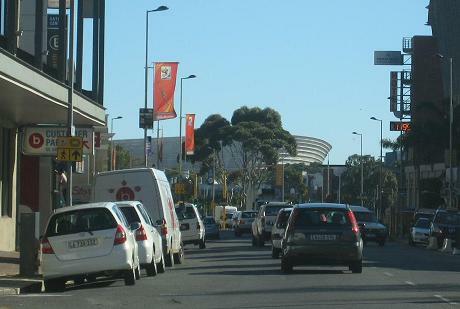 The new pedestrian fan walk promises to be a easy, safe, well signposted and entertaining walk from the Cape Town City Center to the Cape Town Stadium and back. And safe it seems to be already now. We just took the fanwalk through Cape Town last weekend and were pleasantly surprised by the number of people already using it for a weekend outing with families and kids. 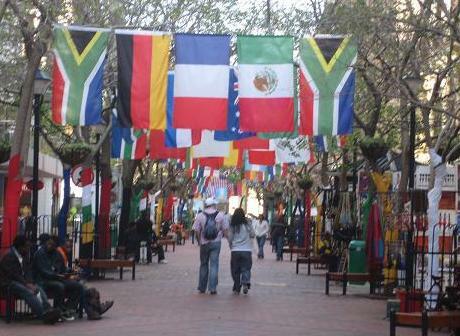 The Fanwalk starts at St. George's Mall, Cape Town's pedestrian zone, which is decorated with hundreds of flags as you can see in the picture above. Along St Georges Mall you will find many stalls selling worldcup accessories like vuvuzelas and makrabas. Here diski dancers, djembe drummers and marimba players are already entertaining the locals and tourists alike with their talents. 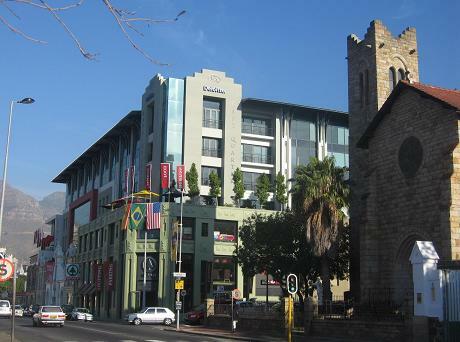 The Cape Town Fan walk actually starts at Exchange Place in St Georges Mall and leads up Waterkant Street, crossing over busy Buitengracht Street on a newly built bridge to Prestwich Memorial Place. Here is a picture taken in Waterkant Street. During the Worldcup Days in Cape Town the Fanwalk will be in operation with all its entertainment like stilt walkers, acrobats and marimba players and many more, seven hours before the start of each of the eight soccer matches at the Cape Town Stadium. Then the new FanWalk will lead along Somerset Road with all its shops and restaurants and adjoining hip Cape Quarter Shopping Village with lots of local arts and crafts as well as designer shops and delightful coffee shops, sports bars and fancy restaurant. From the Cape Quarter you have some views of the new Cape Town Stadium already, even if you only have done the walk halfway. 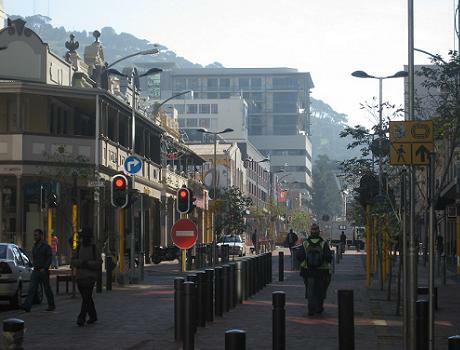 However the distance is easy to walk as it the walkway is not only wide but also flat, apart from the short uphill path up St George's Mall in Waterkant Street. From Victoria Junction starting at Ebenezer Street you will be able to walk on a newly build pedestrian walkway where many colourful huts were erected for the Worldcup which will be open during Match Days and where you can buy local arts and crafts and more soccer paraphernalia. You can also expect the Fanwalk to be illumiated with hundreds of lights and 40m high sky beams on Worldcup Match days and buzzling with various entertainment for the soccer fans. Once you reach Greenpoint's main entertainment area with its popular bars and restaurant szene, you will be suprised how fast the fanwalk really brings you to the Stadium. The station of the newly built IRT bus system at the Cape Town Stadium is well worth a good look, even if you do not want to go back to town by bus. The walkway to the platform is adorned with thousands of tiny mosaic stones which form beautiful displays of local events and celebrate the City's cultural events. Here is one mosaic depicting the typical Cape Town soccer fans. Enjoy the great new Cape Town Fanwalk! Interested in more Cape Town Insider Tips? Then subscribe to my monthly ExpatCapeTown Newsletter here.